Andy Goram, the Rangers 9-in-a-row legend known affectionately as 'The Goalie' speaks exclusively to Unionist Voice. 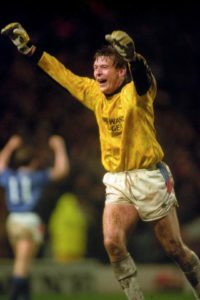 Andy Goram lived the dream as a mainstay of the Glasgow Rangers 9-in-row team. He is an Ibrox legend who fulfilled his boyhood dream ending his career playing for Sir Alex Ferguson at Manchester United. The man, known affectionately as ‘The Goalie’, has also had his fair share of troubles over the years, but his enthusiasm for life remains undimmed. He is a man who still has much to offer the sport he loves so dearly. I started by asking him what he is doing with himself now; “I speak at functions and do question and answer nights. I am not currently involved in coaching, I haven’t been asked. I have so much to give back, I belong on a football pitch and I suppose I am just waiting for the right opportunity to arise”. Judging the best player he played with was a difficult one for Goram. The Rangers legend says he never had the privilege of playing with Davie Cooper and Jim Baxter, and singles out two 9-in-a-row legends as the best players he did play with. “I disrespected the gaffer once by not returning from Tenerife. That was a big regret and disappointment. He put me on the transfer list, and rightly so, but he got the right reaction from me and I was rewarded with a new contract” he then added with a smile “he is a great man”. It is evident that Goram is a man that lived the dream, made some mistakes along the way but continues to enjoy life. His love for Rangers is as strong as ever. I finished by asking how he would like to be remembered, he said simply “as a Rangers man”.